Crudité is a seriously fun word to say. 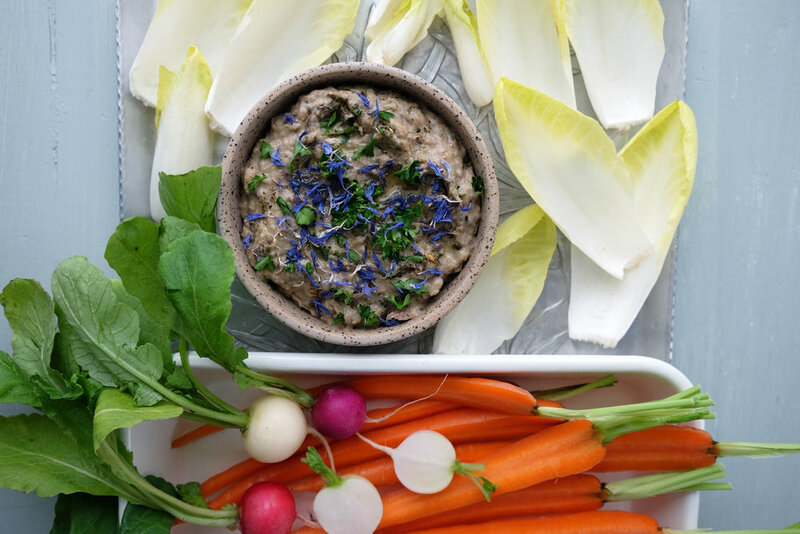 Anyway, I’m always looking for reasons to eat more raw veggies in the winter, and this 5-Ingredient Baba Ganoush is reason enough for me. I’m of the mindset that the more roasted garlic the better, but please adjust to your liking. If you don’t have apple cider vinegar, lemon would do the trick in this recipe. If you’re entertaining, serve with Raw Cashew Ranch and beet hummus to diversify your spread. 1.) Preheat the oven to 400°F. Cut the eggplants into 3/4″ rounds. Lay flat on cutting board or work surface. Salt the flesh of each round, and allow to sweat for about 10-15 minutes. Once eggplant has released water, use a paper towel or clean, dry cloth to wipe salt from each round. 2.) Place eggplant and whole garlic cloves in a glass pan or on a rimmed baking sheet. Drizzle with avocado oil. Roast in the oven for about 30 minutes, flipping once. Eggplant and garlic should be browned and very soft when done. 3.) In a high-speed blender or food processor, blend the roasted eggplant, garlic, tahini, white miso and apple cider vinegar. Add a small amount of water if needed to achieve desired consistency. 4.) Fold in salt and pepper to taste. Garnish with fresh parsley, za’atar, olive oil and dried cornflowers. Enjoy!